For those looking to obtain a generous bonus this season, now is your chance with the Chase Premier Plus CheckingSM account! Earn a $300 bonus just for opening an account and setting up a direct deposit and is available online or in-branch. This is one of the fastest and easiest ways to score some cash if you’re looking to open a new bank account. Chase’s Premier Plus Checking account has a load of features worthy of checking out. Withdraw cash at one of Chase’s 16,000 ATMs, access account information and get guidance at one of their and nearly 5,000 branches, and view account activity, transfer funds and more 24/7 using the Chase Mobile app or on chase.com! This offer is available for a limited time only. • Enjoy $300 as a new Chase checking customer, when you open a Chase Premier Plus CheckingSM account and set up direct deposit. 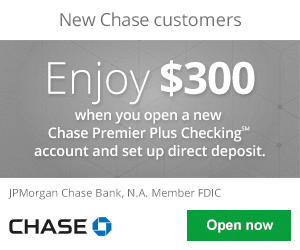 • Enjoy $300, more benefits, and earn interest on your new Chase checking account. • The $25 Monthly Service Fee is waived when you keep an average beginning day balance of $15,000 or more in any combination of this account and linked qualifying Chase checking, savings and other balances. • No Chase fee on first four non-Chase ATM transactions per statement period. • Earn interest on your checking account balance. Direct Deposit Requirement: Yes(employer payment or government benefit count as DD). Closing Account Fee: Must wait at least 6 months, otherwise $300 bonus will revert back. Open a new Chase Premier Plus CheckingSM account. Have a direct deposit made to this account within 60 days of account opening. There is no specified minimum direct deposit amount. After all requirements are met, you’ll receive the $300 bonus deposited into your account within 10 business days. If the account is closed by either you or Chase within six months after opening, your bonus will be deducted. Enjoy Chase Liquid® Card(s), perfect for everyday use. Enjoy no-fee reloads, directly from your smartphone. No Monthly Service Fee on your Chase Liquid Card for Chase Premier Plus Checking account holders. Interest rates are variable and may change. Additionally, fees may reduce earnings on the account. Bonus is considered interest and will be reported on IRS Form 1099-INT (or Form 1042-S, if applicable). The Chase Premier Plus CheckingSM account is a great account to have if you’re trying to decide which bank to earn interest with. 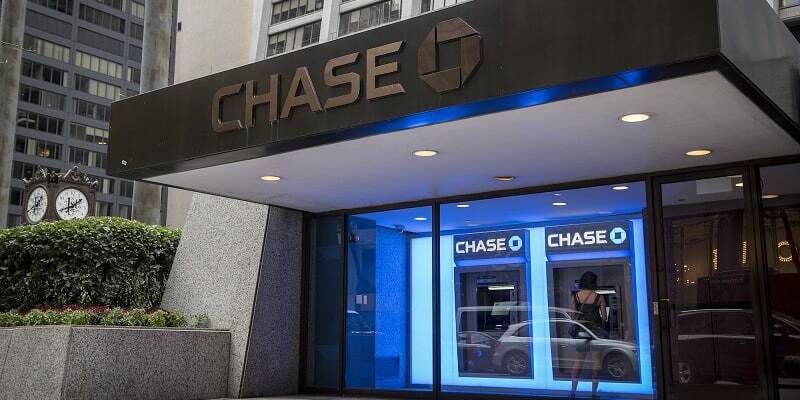 Once you set a direct deposit to your Chase Premier Plus CheckingSM account within 60 days of account opening, your bonus will be deposited within 10 business days. Additionally, you will have instant access to a wide range of account features! How great is that? However, if you are not interested, then be sure to see our complete list of Bank Bonuses and Chase Bank Bonuses for all your banking needs!